The 42.1 metre motor yacht TCB has changed central agencies and is now listed for sale with Mark Osterhaven and Michael Mahan at Worth Avenue Yachts. Designed by Ward Setzer she was built in GRP by Richmond Yachts to ABS class and MCA code with delivery in 2004 and a refit in 2014. Designer Sean Pavlik was responsible for her cool, uncluttered interior decor that can accommodate up to 12 guests in six cabins. These consist of a full-beam master suite on the main deck, a VIP suite on the skylounge deck, two doubles and two twins, all with entertainment centres, flatscreen television sets and en-suite bathroom facilities. 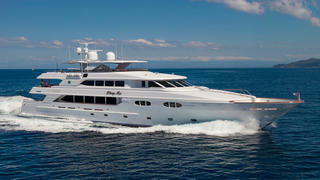 In addition, there are quarters for eight crewmembers split across four cabins aboard this yacht for sale. The open-plan main saloon has a lounging area with U-shaped seating to port, a bar, fridge, ice maker and an entertainment centre including a LED television screen. Forward is a formal dining area with seating for 10 guests. The skylounge is devoted to more informal relaxation on a crescent-shaped settee, numerous armchairs and an entertainment centre including a 55-inch Sony LED television and a Kaleidescape server providing on-demand audio and video throughout the yacht. The sun deck is in a class of its own, offering sun pads and loungers, a bar, fridge, ice maker, ample seating, al fresco dining tables, a Jacuzzi and a 42-inch Sony LED television screen. Twin 2,250hp Caterpillar engines give her a cruising speed of 15 knots and she is fitted with Trac zero-speed stabilisers.